Then will the eyes of the blind be opened and the ears of the deaf unstopped. Then will the lame leap like a deer, and the mute tongue shout for joy… Gladness and joy will overtake them, and sorrow and sighing will flee away. Armenia was in large measure Christianized by Gregory Lousavorich ("the Illuminator": consecrated 302 AD; died 332), but, as Armenian had not been reduced to writing, the Scriptures used to be read in some places in Greek, in others in Syriac, and translated orally to the people. A knowledge of these tongues and the training of teachers were kept up by the schools which Gregory and King Tiridates had established at the capital Vagharshapat and elsewhere. As far as there was any Christianity in Armenia before Gregory's time, it had been almost exclusively under Syrian influence, from Edessa and Samosata. Gregory introduced Greek influence and culture, though maintaining bonds of union with Syria also. When King Sapor of Persia became master of Armenia (378 AD), he not only persecuted the Christians most cruelly, but also, for political reasons, endeavored to prevent Armenia from all contact with the Byzantine world. Hence his viceroy, the renegade Armenian Merouzhan, closed the schools, proscribed Greek learning, and burnt all Greek books, especially the Scriptures. Syriac books were spared, just as in Persia itself; but in many cases the clergy were unable to interpret them to their people. Persecution had not crushed out Christianity, but there was danger lest it should perish through want of the Word of God. Several attempts were made to translate the Bible into Armenian. In 397 the celebrated Mesrob Mashtots and Isaac (Sachak) the Catholicos resolved to translate the Bible. Mesrob had been a court secretary, and as such was well acquainted with Pahlavi, Syriac and Greek, in which three languages the royal edicts were then published. Isaac had been born at Constantinople and educated there and at Caesarea. Hence he too was a good Greek scholar, besides being versed in Syriac and Pahlavi, which latter was then the court language in Armenia. But none of these three alphabets was suited to express the sounds of the Armenian tongue, and hence, an alphabet had to be devised for it. Not till the 8th century was the Apocrypha rendered into Armenian: it was not read in Armenian churches until the 12th. Theodotion's version of Daniel was translated, instead of the very inaccurate Septuagint. The Alexandrine text was generally followed but not always. 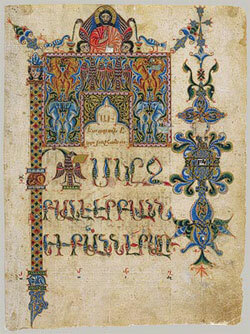 In the 6th century the Armenian version is said to have been revised so as to agree with the Peshitta. Hence, probably in Mt 28:18 the King James Version, the passage, "As my Father hath sent me, even so send I you," is inserted as in the Peshitta, though it occurs also in its proper place (Joh 20:21). It reads "Jesus Barabbas" in Mt 27:16,17--a reading which Origen found "in very ancient manuscripts." It contains Lu 22:43,44. As is well known, in the Etschmiadzin manuscript of 986 AD, over Mr 16:9-20, are inserted the words, "of Ariston the presbyter"; but Nestle (Text. Criticism of the Greek New Testament, Plate IX, etc.) and others omit to notice that these words are by a different and a later hand, and are merely an unauthorized remark of no great value. This version was first printed somewhat late: the Psalter at Rome in 1565, the Bible by Bishop Oskan of Erivan at Amsterdam in 1666, from a very defective MS; other editions at Constantinople in 1705, Venice in 1733. Dr. Zohrab's edition of the New Testament in 1789 was far better. A critical edition was printed at Venice in 1805, another at Serampore in 1817. The Old Testament (with the readings of the Hebrew text at the foot of the page) appeared at Constantinople in 1892 ff.